"Today, more than ever, new products and materials need to be made efficiently, and in an environmentally sustainable way," says Huw Davies, director of the new center. Emory Photo/Video. "We believe that C-H functionalization will have a huge impact on the development of new drugs and other fine-chemical products, by breaking new ground for organic synthesis, and making it faster, simpler and greener," says Huw Davies, professor of chemistry at Emory and the director of the Center for Selective C-H Functionalization (CCHF). Most of the synthetic products of modern daily life — from our coffee cups and clothes to medications — are derived from organic synthesis. Chemists start with simple, bulk chemicals that are readily accessible, like petroleum and plant extracts. These bulk materials are converted into commodity chemicals and then into finer chemicals through step-by-step transformations. These steps eventually lead to more elaborate structures like plastic, nylon and drugs. 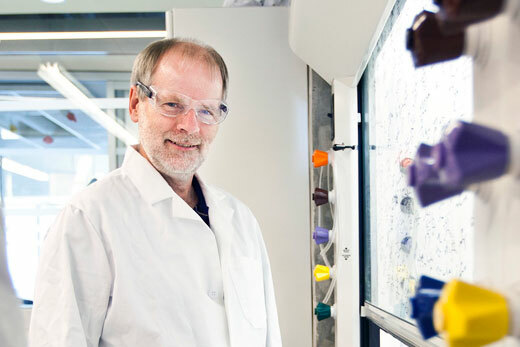 "The center is at the forefront of a major paradigm shift in organic chemistry," Davies adds. "We’re not just driving new methods of synthesis, we’re building new models for teaching and research."